We are a Cape Cod design-build and remodeling firm which provides personalized attention to detail on every aspect of your project. We specialize in reclaimed materials, tactfully combining those “green” materials with the latest technologies and innovations in the building industries. We help transform your vision for your project into the finest artisans’ work. By utilizing a custom web-based software program that encompasses scheduling, material selections and specific financial information for each step of your project, we are able to provide you with the peace of mind of absolute transparency on costs and progress for your project, whether you are local or thousands of miles away. Carpet Barn is family owed and has been local since 1971. We strive to give our customers what they want, with guidance and honesty. We offer everything from carpet, tile & stone, cabinetry & counter tops and much more with our large showrooms to help you see what you are looking for. Our goal is to make every customers dream a reality and by doing that we do not let our customers feel defeated, there are no problems, only solutions when you shop at Carpet Barn. We are your one stop shop to getting everything you need for your home or room remodel. We have four locations to make your shopping Experience as easy and painless as possible. We pride ourselves by helping every customer to our fullest potential with knowledge and experience. 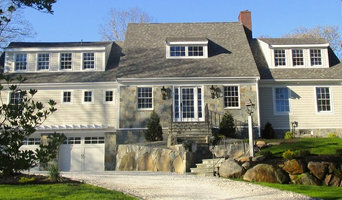 We are a general contractor located in North Falmouth, MA. We are a complete frame to finish contractor servicing Cape Cod, the island, and the south shore area. Our work includes both renovations and new construction. Our goal is to provide our clients with a finished product that they are proud to call home. We work diligently to keep any project large or small on budget and on time. Working with function and efficiency in mind ensures a clean and safe job site. Using only reputable sub contractors who hold the proper insurance and licensing ensures that each phase is completed and held to the highest standards. Best of Houzz winner for 2017! We are your one-stop shop for kitchen and bath remodeling in Eastern Massachusetts, Cape Cod, and the Islands. Offering complete services from design/specification to supplying materials to construction, IKitchens Etc makes the remodeling process easy. At their design studio, clients can select from stock or custom cabinets, countertops, tile, flooring and more. 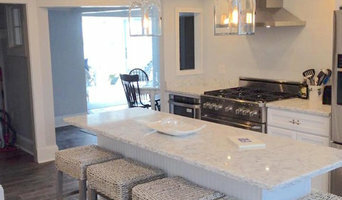 Specializing in projects for off-Cape clients, iKitchens Etc uses a cloud-based project management software to communicate, post daily progress photos and keep the schedule up-to-date. Dream. Plan. Create. Enjoy. Kitchen Design Center and *Hunter Douglas Authorized Dealer* An award winning cabinet architecture and design company, Main Street Kitchens at Botellos consistently brings distinction to residential kitchens, baths, window coverings and interior designs. Our Osterville, MA kitchen renovation was selected as "Kitchen of the Week" on Houzz (search "Kitchen of the Week: A Cape Cod Classic") Our dedicated designers, craftspeople, and installers offer the highest quality cabinetry with an impressive range of styles, colors, woods, mouldings, and hardware. Your design choices are virtually limitless. Whether the style is contemporary or traditional, our designers collaborate and share ideas to create living spaces that define our clients' personal style while bringing a balanced blend of beauty and functionality to their designs. Salt Architecture provides full service custom residential architectural services for Cape Cod, Martha's Vineyard and Nantucket. Focusing on thoughtful, sustainable and contextual design for your home. Dewey Gardens is a landscape design and installation company that has been serving Cape Cod since 2006. Creating a niche market on Cape Cod, Dewey Gardens provides both highly informed and inspired design solutions for our customers along with knowledgeable and efficient installation services. As a result, customers benefit from experiencing a seamless transition between the design and installation phases of a project. We are continuously aware of the relationship between a cultivated landscape and its surrounding environs. We are committed to maintaining the inherent character and feel of a place while seamlessly meeting the goals and expectations of our customers. Our staff includes a team of dedicated, hard working individuals who take pride in their work. They are educated about the tasks that we ask of them and are concerned about our customers satisfaction. At all times, we attempt to ensure that there is good communication between our customers, employees and principals. We work with customers to meet their unique goals while maintaining the integrity and vitality of this spectacular place we call Cape Cod. Entering our tenth year, we are determined to provide responsible, creative solutions to all the landscape opportunities we encounter and we look forward to doing business with you! Blue Claw Landscape Development is a full service landscape construction and maintenance company, based in Cape Cod & on Nantucket Island. Our company roots go back over twenty years in humble beginnings on Nantucket Island in the 90's, with expansion to the Cape in 2000, and has evolved into the company we are today. We are a busy group of committed artisans - while we don't take on more than we can handle - we encourage you to line up your projects as soon as you are ready to pull the trigger, as our schedule can be rather full. Our construction clients are homeowners, architects, builders, landscape architects, landscape designers, property managers, civil engineers, and landscaping companies. Our team of landscape installers have decades of experience. Our artisans have worked on some of the most stately homes and premier private clubs and commercial projects on the Cape & Islands. Our maintenance division maintains residential homes as well as commercial properties. We are the first on Cape Cod to offer an Eco-Friendly, All-Electric Lawn & Maintenance Service! Our approach is simple - we don't over-promise and we always seek to over-deliver. When you hire Blue Claw Landscape Development, we professionally communicate a production schedule that meets your needs before we execute to commence the work. INTEGRATA is an architecture + construction company based in Falmouth, MA that focuses on sustainable design and construction. INTEGRATA architecture + construction provides client-specific architectural designs that integrate multiple building systems to maximize efficiency, functionality and aesthetics. Unlike other architecture firms, we also provide construction management services, which enables us to ensure proper execution of our design plans during the building process. INTEGRATA creates custom homes and transforms existing dwellings into beautiful, truly sustainable and comfortable high performance buildings. Through a seamless, transparent and collaborative process from design through construction, we have been able to virtually eliminate cost and time overruns on projects that we design and build. Clear and forthright communication, comprehensive planning, and continuous cost monitoring are the cornerstones of our success. The architects at Jill Neubauer Architects Inc., of Falmouth, Cape Cod, offer personal attention in the creation of cottages, homes, barns, and “glamps” for families of the Cape Cod, Islands, and New England region. Our projects vary from historic to modern, both in new structures and renovations. We work very closely with our Clients to build effective personal relationships that we maintain throughout the process. We strive to understand each Client’s unique set of goals for their property and family so that we may successfully realize them; these criteria become the driving force of the design process. The final image of a building, like every other aspect of it, is the result of our dedication to create the appropriate response to the interests of the owner and the context in which the structure exists. JNA collaborates with landscape architects to enrich your project and ensure that the structure complements your property by focusing on the relationship of space to each special site. We consider views and sight lines, sunlight, breezes, and environmental fragility in orienting and designing structures to ensure that the entire property is incorporated into the design. We bring green building design knowledge to our projects using energy‐efficient technologies, non‐toxic material selections, and sustainable products. We can help you build responsibly whether you are just learning about “going green” or have the most advanced knowledge and goals. As a U.S. Green Building Council member, JNA has access to extensive resources for consultants and is committed to improving both your home’s environment as well as the earth’s. When requested, we pursue LEED Certification on new and significantly renovated projects. Whether pursuing LEED Certification or not, JNA strives to build utilizing LEED best practices. But before you start sending out dozens of emails and making phone calls, sit down and think about your project. What's your budget? What is the scope of your project? Will you need more than one type of professional to complete your home improvement project in North Falmouth, MA? Can you afford to complete the full project now, or should you tackle it bit by bit? 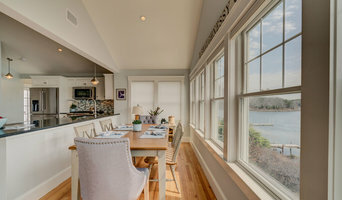 Once you've settled on your project’s priorities, budget and scope, it's time to start researching North Falmouth, MA home design professionals. Don't sell yourself short and settle on the first professional you set your sights on. Make sure that you're working with someone local, who can get to the jobsite easily and efficiently. Look into the person’s reviews, ask to speak with former clients and to see previous jobs in person. Take a good look at their portfolio photos: How similar are these projects to your own? Be honest — that mansion might look beautiful, but it might not have a lot in common with your little bungalow. Reach out to multiple professionals — especially for larger projects — and don't settle for the first bid you hear. Comparing multiple North Falmouth, MA professionals' bids and experiences can help you find the one that’s best for you. Ask a lot of questions now, so you won't have unexpected answers later. Find a home design professional on Houzz. Narrow down your search by type of professional and location. Browse North Falmouth, MA portfolio photos, read client reviews and contact each North Falmouth, MA professional for more information. Check out the information in the specialized professional sections too for tips on how to hire the right professional for your project.